A sea breeze is an example of a mesoscale front. They may extend across an entire coastline but may move inland only a few miles. A sea breeze is a local effect that occurs due to the temperature contrast between the land and the water. The density of cooler air is greater than that of warmer air. Therefore, the air pressure will be lower at the surface in the warm region due to the rising of this less dense air. During the day, the land is warmer than the ocean when a sea breeze occurs. Denser air over the ocean flows toward the less dense air over the land. This creates a mesoscale cool front that may extend just past the coastline to a few miles inland. The sea breeze front is important because it can be a trigger mechanism for afternoon thunderstorms and can bring a nice relief from hot weather along the coastline. The two primary reasons for the development of low and high pressure are due to the vertical motion of air and the temperature structure of the troposphere. When air rises it will lower the pressure and when air sinks it increases the pressure. Further, the temperature structure is also important and this comes into play in all scales from the sea breeze to the development of the jet stream. Warmer air is less dense and thus occupies a greater volume and thus a greater vertical depth. The troposphere is taller when air is warmer. Colder air is more dense and thus occupies a smaller volume and thus a lesser vertical depth. The troposphere is shorter when air is colder. When a sea breeze develops the low that develops on land is due to the rising air. The high aloft over the land is caused by the troposphere being taller than it is over the water (the air above the land is hotter than the air over the water). With a taller troposphere the pressures are going to be higher than they will be at a location over the water that is at the same elevation. Pressure decreases more rapidly with height in colder air and less rapidly with height in warmer air. Thus, there is a relative high aloft over land and a relative low aloft over the water in the sea breeze situation due to the differing temperature structures over the land and water. 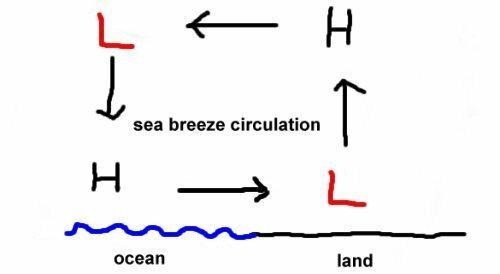 The diagram below shows a sea breeze circulation.